Nobody remembers who coined the term “Dirt Person” for members of the trail crew. It might have been Kathy Blum back in the mid-90s. It’s a perfect description for people who work outside on dirt paths that go through the woods. Sometimes you come home covered with dust, splattered with pitch or mud, sweaty, with sawdust and tree needles falling out of your clothes. You get cleaned up and go do it again the next day. My rural southwest Washington upbringing prepared me for this life. If you didn’t go out to play when it was wet, you didn’t go out to play very much. My siblings and cousins and I all had rubber boots, and nothing was more fun than stomping through squishy mud, splashing in puddles and cricks, and building dams and canals. We were also a gardening family, and I loved to walk behind Dad and the rototiller in my bare feet. You learn to leave your muddy boots and dirty shoes at the door when you come in the house. You learn the virtue of work and the soil. You get to eat cucumbers and corn-on-the-cob from the garden. I was never not a Dirt Person. Yesterday I was grubbing around with the pulaski, feeling glad to be well enough to be out in the warm sun. Kneeling down with hands in dirt is good therapy for a troubled mind, or an untroubled mind for that matter. My yard was grass and weeds when I bought this house five years ago. Now there are flowers, berries, vegetables, pathways and little patches of lawn. A lot of dirt has been moved, and will continue to be moved. I won’t be with the trail crew as much this summer, so I will have to be satisfied with the dirt at home until this fall. And the dirt that art supplies are made out of. 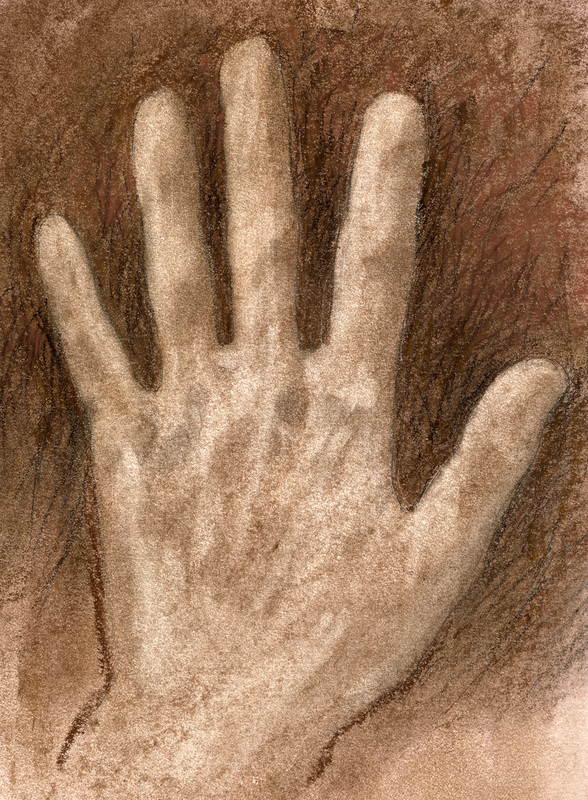 The first pigments were from the earth, so drawing with brown pastels and charcoal makes my fingers just as dirty as digging does. Deb, this piece is a sort of therapy for any reader of it.